Belleek first Christmas ornament in the shape of a baby shoe. The Baby's First Christmas ornament was introduced in 2016 and features Belleek's hand painted shamrocks. 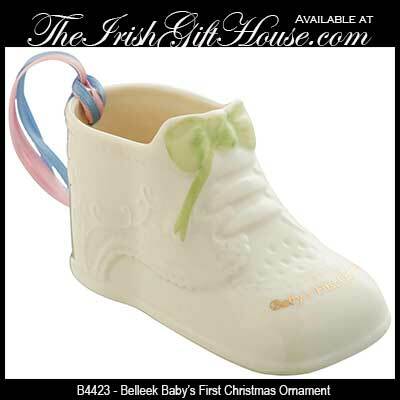 The Belleek Christmas ornament is in the shape of a baby shoe that features green laces and Baby's First Christmas is painted in gold leaf. This Irish baby ornament features Belleek's hand painted shamrock on the sole and measures 3.8" long x 2" wide x 2.1" tall; it is ready to hang with the included blue and pink ribbon. The Irish baby's first Christmas ornament is hand crafted and hand painted in Belleek, Ireland and it is gift boxed with a shamrock history card, complements of The Irish Gift House. Belleek ornament commemorates your first Christmas together and it would make a lovely Irish wedding gift.